"Kansas may soon furnish the hair for the very fine Angora rabbit yarn which is now imported from France," said H. Lee Mallory, a manufacturer of New York city, at the Hotel Baltimore last night. Mr. Mallory and his wife are on their way to the coast. "The finest yarns at present are those of the Angora rabbits. These yarns are woven into the very expensive jersey, or sweater coats, and other articles of apparel. It is a silky yarn, much softer than any other, and very warm. Next to the Angora rabbit comes the llama of South America, the India cashmere and the Angora goat. A few years ago a Kansan happened to be in France at the same time I was, and he took home some of their Angora rabbits. They thrived in Kansas, and the hair he sent me last year was fully equal to the imported hair. "The automobile is responsible for the popularity of the sweater or jersey coats and costumes," continued Mr. Mallory. "The manufacturers are now turning out complete suits, consisting of helmet caps, or hoods, coats, mittens and slippers. Slumber robes have also been added to the list of articles for the benefit of those who wish to sleep in the open. Dressed in these garments, a person could almost brave a trip to the North pole. "Mr. Stoddard, I want you to meet Mr. Stoddard," said Clerk George Mong at the Coates house last evening as he introduced Rock Stoddard of Joplin, Mo., to G. L. Stoddard of Utica, N. Y. The latter had just signed the hotel register, and Rock Stoddard was waiting to pay out. Both Stoddards are traveling men and it developed that back several centuries their forefathers were related closely. In the seventeenth century three brothers crossed the ocean from England. One settled in New York state, the other in Connecticut and the other in Canada. The descendants of the brother who settled in Connecticut and New York fought in the revolutionary war. G. L. Stoddard, whose home is in Utica, N. Y., said that the brothers who settled in the States finally drifted together in New York state. Several of the descendants have since gone West and South. He is a descendant of the brother who settled in Connecticut. Rock Stoddard, whose home is at Joplin, is a descendant of the brother who went to Canada. Captain J. H. Waite, at the head of the Florence Crittenton mission and home, located in an old dwelling at 3005 Woodland avenue, made the statement last night that by next summer the institution hopes to be in a new fireproof building. It is to be erected, he said, on the corner of Thirtieth street and Woodland avenue, where they own 156 feet fronting on the latter street. "The foundation should be laid within the next ninety days," said Captain Waite, "so that work on the super-structure may begin in the spring. We have planned a building to cost between $10,000 and $14,000. As we want to make it absolutely fireproof and of reinforced concrete, we anticipate that the cost will be nearer $14,000. It is a grand institution and has done and is doing the noblest kind of work." The Florence Crittenton Mission and Home for unfortunate girls was started in this city on February 4, 1896, with an endowment of $3,000 from Charles N. Crittenton, the millionaire philanthropist of New York, who died suddenly in San Francisco Tuesday. It first was situated on the northeast corner of Fourth and Main streets in a large three-story brick building which now has been torn down to make space for a city market. After being at the original location for a short time it was decided to abandon the downtown mission work and establish a home. The institution then moved to Fifteenth street and Cleveland avenue into rented property. In June, ten years ago, the property at the southeast corner of Thirtieth street and Woodland avenue was purchased for the home. "A debt hangs over our heads for some time," said Miss Bertha Whitsitt, superintendent of the home yesterday, "but now we have 156 feet frontage on Woodland avenue on which we expect soon to erect our new building. "Since the beginning of the mission and home," continued Miss Whitsitt, "we have cared for 582 young women, the majority of them with children. Just during the last year we cared for twenty-eight young women and twenty-three children. When totaled the number of days spent in the home by all of them amounts to 4,612, which we record as so many days of charity work." 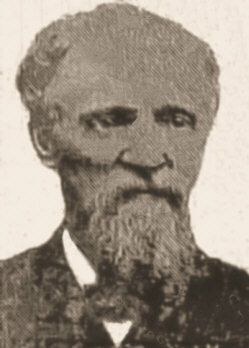 Captain J. H. Waite, who has been at the head of the home for many years, said that Mr. Crittenton had given the home and mission $3,000 to start on. When the property at 3005 Woodland was purchased the National Florence Crittenton Home at Washington gave about $1,500 toward buying and improving the property. DEATH OF MRS. E. CORRIGAN. Mrs. Edward Corrigan, one of the best known women in Kansas City in earlier years, died Monday at the home of a sister in Sandy Hill, N. Y., after an illness of eight months. She was 64 years old. The body will reach Kansas City at 7:16 this evening and will be taken to the home of Mrs. Matt Kinlen, a relative, at 3312 Flora avenue. Funeral services will be from Mrs. Kinlen's residence at 10:30 Sunday morning, and from St. Vincent's Catholic church, thirty-first street and Flora avenue, at 11 o'clock Burial will be in Mount St. Mary's Cemetery. Mrs. Corrigan lived in Kansas City for about twenty years, during which time she was at the forefront of almost all Catholic charities and was associated with others in non-sectarian undertakings. She was prominent in church work, one of her munificence being the high alter in St. Patrick's church. Since leaving Kansas City the home of Mrs. Corrigan has been in Chicago, but she has paid frequent visits to her friends here. Mr. and Mrs. Corrigan had no children. A brother of Mrs. Corrigan, Daniel Quinn, lives in Kansas City. Mr. Corrigan is a brother of Bernard Corrigan, president of the Metropolitan Street Railway Company, and Patrick Corrigan, a retired business man. Lord Charles Beresford, former admiral of the British navy, in company with his solicitor, Orlando Hammond of New York city, dropped into Kansas City from Chicago yesterday morning for a conference with Robert Moss, manager of the Texas and Mexico ranches Lord Beresford owns. Incidentally Lord Beresford received a check, the proceeds of a sale of 1,000 head of cattle which had been sold on the Kansas City market during the last week. The shipment was made from his ranch at Ojitos, Chihuahua, Mexico. Lord Beresford thought when he left Chicago that he might have to make a trip to his ranches to settle some business affairs, but last evening he said he would attend to all of his business in Kansas City. He and Mr. Hammond were met yesterday morning by Robert Moss, his manager and the trio drove to the Hotel Baltimore, where they breakfasted. They were joined there by J. MacKenzie and T. J. Eamans, who took them for a ride over the boulevards and then for luncheon at the Country Club. Another ride followed and the party returned to the Hotel Baltimore, dust covered and hungry, about 6 p. m. Lord Beresford and Mr. Hammond will remain in the city until Monday evening. "I have been in Kansas City before, but I have never had the pleasure of a trip over your boulevards and through your parks," said Lord Beresford, "until today. Even this morning I feared that I would not have the time to thoroughly enjoy it. I want to say that the ride was a surprise to me. I have been over many drives and boulevards but I cannot recall a city I have ever been in that the boulevards excel those of Kansas City. "Next to the boulevards, I was impressed with the playgrounds. We drove to each of the playgrounds, and I was greatly interested in watching the children as they scampered about and enjoyed themselves with the swings and apparatus. In this your country is ahead of England. You have so much more room, though, than we have. Ground is so much more expensive in England than it is here, but England has taken the cue from America, and she has begun the establishment of these playgrounds. "I saw the site of the new depot and the plans were explained to me. I am surprised that Kansas City has gotten along as long as it has with that old excuse for one. You will no doubt appreciate the new one much more, as the contrast will be so great that you will forget all about the inconveniences of the old one. "Your residence section, especially the newer sections, impressed me greatly. They are different than the sections in the East, where the houses are all crowded on little lots. They remind one more of the English country houses with their wide stretches of lawn and tree-bordered drives and boulevards Altogether I shall remember my trip about Kansas City as one of the most pleasant I have ever taken." Where He Died of Dropsy. Joseph Lucasie, the Albino, who died of dropsy at the General hospital Friday morning, had in addition to an exceptional gift of harmony the distinction of having been one of the original exhibitions of P. T. Barnum, the pioneer showman. It was in 1858 that Barnum heard of the strange family in Holland. The fact that an Albino named Lucase had married an Albino wife and that both had abundant silken hair was in itself nothing remarkable. Barnum could have placed his hand on at least a dozen such couples in different quarters of the world. It was the phenomena of two white-haired, pink-eyed children, a boy and a girl, born of this union, that made the Lucasie family worth having. The offspring of Albinos are almost without exception normal in every way, and the condition of being an Albino is said not to be hereditary. When the Lucasie family was brought over from Holland, Joseph was 8 years old and his sister a few years younger. They were assigned to Barnum's New York city museum in 1859-60, where they were featured as having come from Madagascar and being the last of the great race of Albinos made famous by the writings of H. Rider Haggard. In this role they excited immense interest in the metropolis, attracting large crowds daily. FAMOUS ALBINO FAMILY THAT WAS SHOWN BY THE LATE P. T. BARNUM. When the Barnum museum in New York burned the Lucasie family started out on its own resources and made money. They were picked up by the W. W. Cole circus and taken to Australia, where they were featured with success in a country popularly thought to be the home of the Albino. After their return to America they hired out to the Lemen Bros.' circus, touring the West with it until 1898. Then, Joseph's father, mother and sister died in quick succession, leaving him practically alone in the world. The disruption of the family, which had been such a drawing card as a whole, left Joseph Lucasie in rather poor circumstances. He had, however, one recourse which stood him in good stead up to the time of his death. During the years he spent with Barnum in the museum business he had learned to play the violin. Later he had improved his talent by constant practice, so that when his father died here ten years ago he was able to go into vaudeville and make good. It is said that there are few professional violinists in the west who are not personally acquainted with Joseph Lucasie. Mr. Lucasie at his death was large and thick-chested. His luxuriant growth of white hair had been shorn a year previous because it made his head ache and there was little of the Albino distinctions left about him apparently, with the exception of his pink eyes. He was very sensitive and disliked to be alluded to as "the Albino" or have any name applied to him indicating that he was different from other men. His memory of P. T. Barnum was very vague, owing to the great lapse of time and his extreme youth when he was in the great showman's museum, and he could tell few anecdotes about him. Since 1894 he has lived at 1117 Norton. Joseph Lucasie, who was one of the Albino family which the late showman P. T. Barnum imported from Belgium to his museum in New York city, over fifty years ago, is dying of dropsy at the general hospital. It was thought last night that he could not survive through today. His hair is white as wool and his eyes are pink. 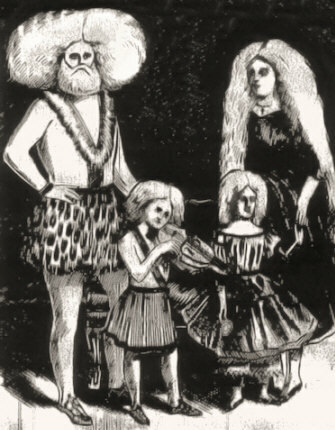 In his show bills, Barnum advertised the Lucasie family, consisting of four members, as being the last of a famous tribe of Albinos of Madagascar. They were Joseph's father, mother and sister. Joseph was 9, and his sister 12 years old. All were musicians. Joseph was taken suddenly ill Wednesday afternoon at his home, 1117 Norton street. Missouri horses are to be used in improving the native Porto Rican animals. A dozen or more will be secured here or from the big breeding farms in Missouri by D. W. May, special agent of the United States government in charge of the agricultural experiment station at Mayagues, Porto Rico, and are to be sent to New York and thence to the island. The Missouri horse, according to Mr. May, has qualities possessed by no other horse in the world. These qualities take in part those of the famous steeds of Arabia, but in addition they have the stamina which the Arab lacks. "The agricultural department has done a great deal of good in the Islands," said Mr. May last night at the Hotel Baltimore. "We have succeeded in producing a much sweeter grade of sugar cane, the tobacco is much better, and the planters will soon raise coffee which will be sold the the United States. At present all of the coffee is heavy and black, and finds no sale in this country. "That the island has progressed agriculturally may be gleaned from a glance at the export figures. The value of exports in 1902 were $8,000,000. Since then they have gradually increased annually until last year the value of exports reached $32,000,000." ing Clan ne Gael Plot. The death of Captain Thomas Phelan, Irish-American patriot and soldier of fortune, which occurred at 2:30 o'clock last Saturday afternoon, in Bremerton, Wash., ended a life full of romance and a checkered career in war and politics. Early in life he was bitten with the wanderlust, and during the early 60s and 70s helped to make history, not only in America, but in Canada and Ireland. Captain Phelan was 76 years old and leaves a widow and four children. Being a native of Ireland, Captain Phelan throughout his life and did all in his power to bring freedom to Erin. He was born near the town of Tipperary and came to America about 1857, locating at Independence, Mo. He married Miss Alice Cox of that city. During the early part of Captain Phelan's life he was embroiled in many attempts to free his native country from the yoke of England. Shortly after his marriage in Independence he enlisted as a volunteer in the Seventh Missouri regiment of the Union army and fought with that regiment throughout the war. He rose from the ranks to a captain. He was in many of the important battles. One of his daring acts committed during the progress of the war was at the siege of Vicksburg. It was necessary to take a steamboat loaded with cotton and other products, and munitions of war, down the river and Captain Phelan was delegated to run the blockade. Transferring bales of hay for cotton around the edge of the boat he succeeded in getting safely through the lines. His name appears in Civil war history as that of the man responsible for breaking the blockade. In the late 60's he gained fame and notoriety by engaging in the Fenian raid from the United States into Canada in a futile attempt to occupy Canada and make it a base of supplies from which to carry on warfare with England for the freedom of Ireland. The Irish in America congregated about Ridgeway, Canada, for the purpose of an uprising and gaining a stronghold in the Canadian country. Some 1,400 Irish left the United States for this purpose, but boats on the waterways cut off a portion, and they failed to land in Canada. A battle in which many persons were killed on both sides was fought by the Irishmen against the Queen's Own regiment. While making a visit to his home country, Captain Phelan learned that the Clan na Gael was planning to blow up an English ship named the Queen. Although against England, Captain Phelan did not believe in destroying innocent passengers, and therefore notified the English ship people. In some manner his part became public, and O'Donovan Rossa, editor of the Irishman of New York, attacked his loyalty in the paper. The incident occurred during the term as mayor here of Lee Talbot. Captain Phelan was called to New York to be given an opportunity to explain matters relative to his informing the British of the intended blowing up of the Queen. 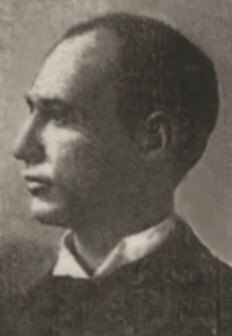 Close friendship had before existed between Rossa and Phelan, and the latter did not realize that he was to be the victim of a trap. He went to New York and entered Rossa's office. While there an endeavor to assassinate him was made by an Irishman living in the East. Captain Phelan was stabbed thirteen times and received a broken arm in the attack. He was confined in a hospital in New York for many months on account of his injuries. The news that he gave the information to the English leaked out through a story of the plot printed in Kansas City and written by Frank P. Clarke, a former newspaper man, now living here. Between the years of 1882 and 1888 Captain Phelan was superintendent of the Kansas City workhouse. He was greatly interested in politics and was a staunch Republican all of his life. When the criminal court was instituted in Jackson county he was appointed clerk of the court and was the first to fill this position. Under Mayor John Moore he served as superintendent of public works. While Colonel R. T. Van Horn was a member of Congress Captain Phelan received the appointment of captain of police of Washington, D. C.
After the civil war he organized Company D of the Third Regiment and was a captain in the regiment for many years. Later he organized Battery B. For the last seven years he had been in charge of a navy yard at Bremerton, Wash., where ships of the United States are repaired. He was holding this position when he died. Captain Phelan belonged to the G. A. R., but was not a member of any other organization. Captain Phelen also figured very prominently in a duel which was never pulled off. The participants were to have been a Captain McCafferty and Captain Phelan. Rifles were the weapons chosen, and seconds and grounds had been picked when friends interfered. At one time a number of Irish left America to aid Ireland, whose sons were to rise against England upon a certain day. Chester, England, was the place of the rendezvous for the Irish-Americans. Arms had been secured for their use. The English troops, however, got wind of the threatened uprising and were sent out in such large forces that the Irish were overawed. 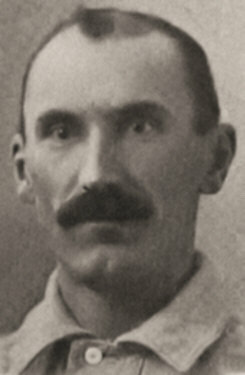 The difficulty between Captains McCafferty and Phelan arose out of the means to be used at this time in trying to free Ireland. Captain Phelan's family resides at 3205 Washington street. Dr. Y. J. Acton of Bremerton notified the family of the death. The body was buried yesterday afternoon in the Soldiers and Sailors' cemetery at Bremerton, Wash., by Captain Phelan's special request. For many years Captain Phelan traveled over the country giving exhibitions of shooting and fencing. He was a crack shot with pistols and rifles, and was a famous swordsman. Captain Phelan, while the Dreyfus affair in France was at its height, challenged Count Esterhazy, accuser of Dreyfus, to a duel with swords, to be fought anywhere in the world. Besides his widow, Mrs. John Young and Miss Annie Phelan, daughters, and two sons, Robert Phelan, a police detective, and Thomas Phelan, survive. Crops Will Be Best Ever. Dr. Leni A. Beltran, a representative of the Cuban government, arrived at the Coates House yesterday and will be in Kansas City for a week. He will examine horses which have been purchased, subject to his approval, for the cavalry force for the island. Dr. Beltran is a native Cuban, but was educated in New York City. "The strides Cuba is making will surprise the world," he declared yesterday afternoon. "Cuba will have the biggest sugar and tobacco crops of its history this year. Tobacco, which was plentiful and of good quality last year, will be much better and more plentiful this year. This year we believe will be the most prosperous the island has had." Jake Beckley, the idol of local baseball fans and one of the most popular men in the profession, has bought a home. "I bought it here," said the great ball player, "because here is where I want to live. I have had no home for so long that I lived under my hat. 'Buses mostly were my homes, and never in the same town more than a week. Now I can see where I want to light, and it is right here in Kansas City. They say there are other places better. I want to say after being in all that everybody else has been in and more than only myself and the natives have been in, Kansas City has them all skinned. I am narrowing down the years till we catch up with St. Louis. It is a great town." "They say it is not, Jake, and that its street cars are on the bum," said a fan who, one of a party of half a dozen, had been listening to the player talk shop. "It is not on the bum, and the town is not. Here is where I have fixed to live. I tell you that I have bought a little home here. I have been all over this continent, from the snow up in Canada to where it was hotter than this in Mexico, and right here is where I camp. I do not like to say how big I think Kansas City will be when I get ready to quit it, for I expect to live to be an old man. I am feeling pretty good now, thank you." Mr. Beckley was then asked how he happened to pick out Kansas City. "I picked out Kansas City because I have been in the other towns," said Jake. "I was in New York and got lost as soon as I got off Broadway. They have one street there and if you get of of it you are in the residence district. The natives never go on it and the tourist and the grafters never leave it. There is a procession of street cars along it and everybody there thinks they are wonderful. If a man has to stand up, and I never got to sit down, he pats himself on the head and says he is in a big, hustling city. If he has to stand up at home he growls and says the street car system must be on the bum. "I go out to the ball park in the 'bus. I always watch the street cars. When I see everybody has a seat and nobody is riding on the footrail or the fender, I know we will be playing to the benches that afternoon. When I see them scrapping with the conductor to get on the roof, 'it's a full house for us, I say Jake, my boy,' and sure enough there is good business. I size up a town from the depot and the hotel lobby first, and then from the street cars." H. Holmes, Jr., Who Is Ill.
Dr. J. F. Binnie left last night for New York, whence he will sail Wednesday to London, whither he has been summoned by the sudden illness of Mrs. Walton H. Holmes, Jr. He expects to reach the British metropolis Sunday. No details have been received here of Mrs. Holmes's condition. W. S. Woods, her father, received the first cablegram, which asked that Dr. Binnie come to attend her. A later and more imperative cablegram asked that he "come at once." Mr. and Mrs. Holmes had intended to leave London for home August 25 and that plan will be carried out if her condition will permit. ST. LOUIS, MO., July 22. -- After a conference here today between D. J. Keefe, United STates commissioner of immigration, and John H. Curran, chairman of the Missouri state immigraiton commisison, it was announced that this state will establish an immigration bureau on Ellis Island, N. Y. There are 11,000,000 acres of unoccupied tillable land in Missouri, according to Mr. Curran, and the purpose of the new bureau will be to get desirable foreigners to cultivate this land.